Dolphy, Pidol, John Puruntong, Kevin Kosme - the many faces of Rodolfo Vera Quizon and all smiling. For a calamity stricken country not to mention disasters caused by people in our government – still, Philippines has its reason to laugh. Thanks to a man, for always there to lift our spirit in times when we are low – Mang Dolphy. I think you can relate to this: Remember those times when we're down, only if cutting a wrist is not painful, lol. Then we open our television sets, and there comes Mang Dolphy wearing one of his many funny faces. I know! I hate it myself, lol but hey after seeing that usual face, a more than the usual face is what we immediately see and our lives will suddenly become lighter. He always carries that charm to make everyone laugh or atleast smile. Tagged as the Charlie Chaplin of the Philippine Cinema and King of Comedy, the life of Mang Dolphy was an inspiration, a rag-to-riches story from peanut vendor, shoeshine boy, factory worker, porter, calesa driver until becoming a king. An inspiration. That is Mang Dolphy. At 8:34 p.m. Tuesday, he was declared dead at the Makati Medical Center due to complications from pneumonia, 15 days short for his 84th birthday. 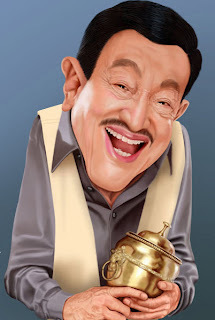 Mang Dolphy, thanks for the laughter. You will be missed. I had an awesome childhood, that’s because of Mang Dolphy.